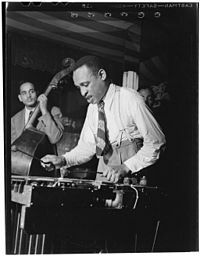 Lionel Leo Hampton (April 20, 1908 – August 31, 2002) was an American jazz vibraphonist, pianist, percussionist, and bandleader. Hampton worked with jazz musicians from Teddy Wilson, Benny Goodman, and Buddy Rich to Charlie Parker, Charles Mingus, and Quincy Jones. In 1992, he was inducted into the Alabama Jazz Hall of Fame, and was awarded the National Medal of Arts in 1996. Lionel Hampton was born in 1908 in Louisville, Kentucky, and was raised by his mother. Shortly after he was born, he and his mother moved to her hometown of Birmingham, Alabama. He spent his early childhood in Kenosha, Wisconsin, before he and his family moved to Chicago, Illinois, in 1916. As a youth, Hampton was a member of the Bud Billiken Club, an alternative to the Boy Scouts of America, which was off-limits because of racial segregation. During the 1920s, while still a teenager, Hampton took xylophone lessons from Jimmy Bertrand and began to play drums. Hampton was raised Roman Catholic, and started out playing fife and drum at the Holy Rosary Academy near Chicago. 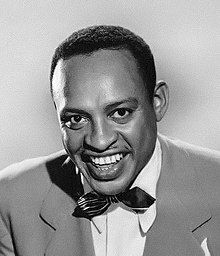 Lionel Hampton began his career playing drums for the Chicago Defender Newsboys' Band (led by Major N. Clark Smith) while still a teenager in Chicago. He moved to California in 1927 or 1928, playing drums for the Dixieland Blues-Blowers. He made his recording debut with The Quality Serenaders led by Paul Howard, then left for Culver City and drummed for the Les Hite band at Sebastian's Cotton Club. One of his trademarks as a drummer was his ability to do stunts with multiple pairs of sticks such as twirling and juggling without missing a beat. During this period he began practicing on the vibraphone. In 1930 Louis Armstrong came to California and hired the Les Hite band, asking Hampton if he would play vibes on two songs. So began his career as a vibraphonist, popularizing the use of the instrument in the process. Invented ten years earlier, the vibraphone is essentially a xylophone with metal bars, a sustain pedal, and resonators equipped with electric-powered fans that add tremolo. While working with the Les Hite band, Hampton also occasionally did some performing with Nat Shilkret and his orchestra. During the early 1930s, he studied music at the University of Southern California. In 1934 he led his own orchestra, and then appeared in the Bing Crosby film Pennies From Heaven (1936) alongside Louis Armstrong (wearing a mask in a scene while playing drums). As far as I'm concerned, what he did in those days—and they were hard days in 1937—made it possible for Negroes to have their chance in baseball and other fields. Also in November 1936, the Benny Goodman Orchestra came to Los Angeles to play the Palomar Ballroom. When John Hammond brought Goodman to see Hampton perform, Goodman invited him to join his trio, which soon became the Benny Goodman Quartet with Teddy Wilson and Gene Krupa completing the lineup. The Trio and Quartet were among the first racially integrated jazz groups to perform before audiences, and were a leading small-group of the day. While Hampton worked for Goodman in New York, he recorded with several different small groups known as the Lionel Hampton Orchestra, as well as assorted small groups within the Goodman band. In 1940 Hampton left the Goodman organization under amicable circumstances to form his own big band. Hampton's orchestra developed a high-profile during the 1940s and early 1950s. His third recording with them in 1942 produced the version of "Flying Home", featuring a solo by Illinois Jacquet that anticipated rhythm & blues. Although Hampton first recorded "Flying Home" under his own name with a small group in 1940 for Victor, the best known version is the big band version recorded for Decca on May 26, 1942, in a new arrangement by Hampton's pianist Milt Buckner. The 78pm disc became successful enough for Hampton to record "Flyin' Home #2" in 1944, this time a feature for Arnett Cobb. The song went on to become the theme song for all three men. Guitarist Billy Mackel first joined Hampton in 1944, and would perform and record with him almost continuously through to the late 1970s. In 1947, Hamp performed "Stardust" at a "Just Jazz" concert for producer Gene Norman, also featuring Charlie Shavers and Slam Stewart; the recording was issued by Decca. Later, Norman's GNP Crescendo label issued the remaining tracks from the concert. Hampton was a featured artist at numerous Cavalcade of Jazz concerts held at Wrigley Field in Los Angeles and produced by Leon Hefflin Sr. His first performance was at the second Cavalcade of Jazz concert held on October 12, 1946 and also featured Jack McVea, Slim Gaillard, T-Bone Walker, the Honeydrippers and Louis Armstrong. The fifth Cavalcade of Jazz concert was held in two locations, Wrigley Field in Los Angeles and Lane Field in San Diego, July 10, 1949 and September 3, 1949 respectively. Betty Carter, Jimmy Witherspoon, Buddy Banks, Smiley Turner and Big Jay McNeely also played with Hampton. It was at the sixth Cavalcade of Jazz, June 25, 1950 that precipitated the closest thing to a riot in the show’s eventful history. Lionel and his band paraded around the ball park’s infield playing ‘Flying High’. The huge crowd, around 14,000 went berserk, tossed cushions, coats, hats, programs, and just about anything else they could lay hands on and swarmed on the field. Dinah Washington, Roy Milton, PeeWee Crayton, Lillie Greenwood, Tiny Davis an Her Hell Divers were also featured. His final Cavalcade of Jazz concert held on July 24, 1955 (Eleventh) also featured Big Jay McNeely, The Medallions, The Penguins and James Moody and his Orchestra. From the mid-1940s until the early 1950s, Hampton led a lively rhythm & blues band whose Decca Records recordings included numerous young performers who later had significant careers. They included bassist Charles Mingus, saxophonist Johnny Griffin, guitarist Wes Montgomery, and vocalist Dinah Washington. Other noteworthy band members were trumpeters Dizzy Gillespie, Cat Anderson, Kenny Dorham, and Snooky Young; trombonist Jimmy Cleveland, and saxophonists Jerome Richardson and Curtis Lowe. The Hampton orchestra that toured Europe in 1953 included Clifford Brown, Gigi Gryce, Anthony Ortega, Monk Montgomery, George Wallington, Art Farmer, Quincy Jones, and singer Annie Ross. Hampton continued to record with small groups and jam sessions during the 1940s and 1950s, with Oscar Peterson, Buddy DeFranco, and others. In 1955, while in California working on The Benny Goodman Story he recorded with Stan Getz and made two albums with Art Tatum for Norman Granz as well as with his own big band. Hampton performed with Louis Armstrong and Italian singer Lara Saint Paul at the 1968 Sanremo Music Festival in Italy. The performance created a sensation with Italian audiences, as it broke into a real jazz session. That same year, Hampton received a Papal Medal from Pope Paul VI. During the 1960s, Hampton's groups were in decline; he was still performing what had succeeded for him earlier in his career. He did not fare much better in the 1970s, though he recorded actively for his Who's Who in Jazz record label, which he founded in 1977/1978. 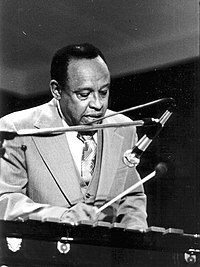 Beginning in February 1984, Hampton and his band played at the University of Idaho's annual jazz festival, which was renamed the Lionel Hampton Jazz Festival the following year. In 1987 the UI's school of music was renamed for Hampton, the first university music school named for a jazz musician. Hampton remained active until a stroke in Paris in 1991 led to a collapse on stage. That incident, combined with years of chronic arthritis, forced him to cut back drastically on performances. However, he did play at the Smithsonian National Museum of American History in 2001 shortly before his death. Hampton died from congestive heart failure at Mount Sinai Hospital, New York City, on August 31, 2002. He was interred at the Woodlawn Cemetery, Bronx, New York. His funeral was held on September 7, 2002, and featured a performance by Wynton Marsalis and David Ostwald's Gully Low Jazz Band at Riverside Church in Manhattan; the procession began at The Cotton Club in Harlem. On November 11, 1936, in Yuma, Arizona, Lionel Hampton married Gladys Riddle (1913–1971). Gladys was Lionel's business manager throughout much of his career. Many musicians recall that Lionel ran the music and Gladys ran the business. During the 1950s he had a strong interest in Judaism and raised money for Israel. In 1953 he composed a King David suite and performed it in Israel with the Boston Pops Orchestra. Later in life Hampton became a Christian Scientist. Hampton was also a Thirty-third degree Prince Hall freemason. In January 1997, his apartment caught fire and destroyed his awards and belongings; Hampton escaped uninjured. Hampton died from heart failure August 31, 2002 and was buried in Woodlawn Cemetery, The Bronx, New York City immediately adjacent to both Miles Davis and Duke Ellington's graves. Hampton was deeply involved in the construction of various public housing projects, and founded the Lionel Hampton Development Corporation. Construction began with the Lionel Hampton Houses in Harlem, New York in the 1960s, with the help of then Republican governor Nelson Rockefeller. Hampton's wife, Gladys Hampton, also was involved in construction of a housing project in her name, the Gladys Hampton Houses. Gladys died in 1971. In the 1980s, Hampton built another housing project called Hampton Hills in Newark, New Jersey. Hampton was a staunch Republican and served as a delegate to several Republican National Conventions. He served as Vice-Chairman of the New York Republican County Committee for some years and also was a member of the New York City Human Rights Commission. Hampton donated almost $300,000 to Republican campaigns and committees throughout his lifetime. 1987 – Honorary Doctorate of Humanities from the University of Idaho – UI's School of Music renamed "Lionel Hampton School of Music." 1986 – The "One of a Kind" Award from Broadcast Music, Inc. The Chronological Lionel Hampton & His Orchestra 1951–1953 (#1429) - includes Hamp's first Norman Granz-produced quartet session (September 2, 1953) with Oscar Peterson, Ray Brown, and Buddy Rich. GHS-1020 (1979) Hamp's Big Band Live! Hampton appeared as himself in the films listed below. ^ Giddins, Gary (September 23, 2002). "Lionel Hampton, 1908–2002; After 75 Years Onstage, a Well-Earned Rest". The Village Voice. Retrieved June 10, 2007. ^ Rick Mattingly. 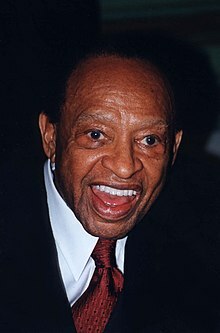 "Lionel Hampton: 1908-2002". PAS Hall of Fame. Percussive Arts Society. Archived from the original on April 2, 2008. ^ "Lionel Hampton (1908-2002)". Hall of Composers. United States Marine Band. Archived from the original on October 19, 2012. ^ Ehrenhalt, Alan (1996). The Lost City: The Forgotten Virtues of Community in America. Basic Books. p. 152. ISBN 0-465-04193-0. ^ a b Yanow, Scott (2001). Classic Jazz. Backbeat Books. p. 94. ISBN 0-87930-659-9. ^ a b c d Voce, Steve. "Obituary: Lionel Hampton (The Independent, London)". Archived from the original on January 2, 2016. Retrieved June 3, 2007. ^ "Nun Taught Hampton". The Vancouver Sun. January 17, 1958. Retrieved October 29, 2011. ^ "DownBeat Magazine". Downbeat.com. February 4, 1959. Archived from the original on September 27, 2013. Retrieved October 11, 2012. ^ Rickert, David. "Lionel Hampton: "Flying Home"". ^ Britt, Stan (1989). Dexter Gordon: A Musical Biography. Da Capo Press. p. 31. ISBN 0-306-80361-5. ^ a b Firestone, Ross (1994). Swing, Swing, Swing: The Life & Times of Benny Goodman. W. W. Norton & Company. pp. 183–184. ISBN 0-393-31168-6. ^ a b c d Yanow, Scott (2000). Swing: Third Ear--The Essential Listening Companion. Backbeat Books. p. 68. ISBN 0-87930-600-9. ^ Scott, William B. (1999). New York Modern: The Arts and the City. Johns Hopkins University Press. p. 263. ISBN 0801867932. ^ Rickert, David. "Jazz article: "Lionel Hampton: 'Flying Home'"". Retrieved November 29, 2012. ^ "Billy Mackel", The New Grove Dictionary of Jazz, ed. Barry Kernfeld, 1988. ^ “Candid Comments” by GERTRUDE GIBSON Review The California Eagle June 30, 1950. ^ Identity & Affirmation Post War African American Photography. California State University Northridge: Institute For Arts & Media. 2011. pp. Page 16 and Page 19. ^ "Lionel Hampton January 4, 1950". jdisc.columbia.edu. Retrieved March 6, 2019. ^ "JAZZ A Film By Ken Burns: Selected Artist Biography – Lionel Hampton". Pbs.org. Retrieved June 27, 2014. ^ "Lionel Hampton Jazz Festival: About". University of Idaho. Retrieved February 2, 2018. ^ "Celebrated Jazz Artist Lionel Hampton Donates His Vibes". Archive.is. June 23, 2007. Archived from the original on June 23, 2007. Retrieved February 7, 2019. ^ "Funeral Services for Lionel Hampton". The New York Times. September 5, 2002. Retrieved April 9, 2008. ^ Cox, Joseph (2002). Great Black Men of Masonry. iUniverse. p. 176. ISBN 0-595-22729-5. ^ Barron, James (January 9, 1998). "PUBLIC LIVES; More Fallout From Lamp Fire". The New York Times. Retrieved April 9, 2008. ^ Jackson, Jeffrey H. (2005). Music And History: Bridging The Disciplines. University Press of Mississippi. p. 102. ISBN 1-57806-762-6. ^ "Paid Notice: Deaths HAMPTON, LIONEL". The New York Times. September 10, 2002. Retrieved June 3, 2007. ^ "Campaign Contribution Search: Lionel Hampton, 1908-2002". NEWSMEAT. Polity Media, Inc. Archived from the original on March 11, 2013. ^ "Lionel Hampton - The High And The Mighty". Discogs. Retrieved February 7, 2018. This page was last edited on 26 April 2019, at 00:37 (UTC).